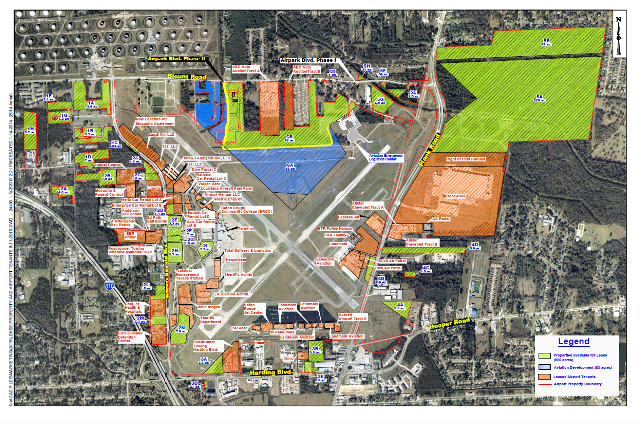 The Baton Rouge Metropolitan Airport comprises over 1800 Acres, with the highlighted areas in green currently available for development. The land lease rates are established based on fair market value appraisals every five (5) years. However, the Airport regulates the escalation in the rental rates do not exceed ten (10) percent of current value for each of the following five-year intervals. The Baton Rouge Metropolitan Airport offers flexible terms to meet investor needs and priorities. All terms of all leases are subject to negotiation by and between the Baton Rouge Metropolitan Airport and the applying parties and/or interests. All terms agreed upon must comply with all FAA Regulations, Title II of Louisiana Law and subject to final recommendation and approval by the Baton Rouge Airport Commission and the East Baton Rouge Metropolitan Council (Airport Authority).